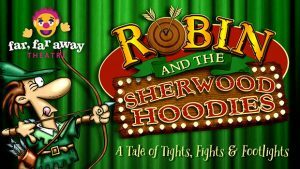 I wasn’t going to turn down the opportunity to be in the audience for the opening night of a show whose poster promises tights, fights and footlights, so was delighted to be in the audience for Far, Far Away Theatre’s production of Robin and the Sherwood Hoodies at Sheffield’s Montgomery Theatre. The colourful, fun-filled family musical introduced the audience to Robin and his merry band on a hilarious, all singing, dancing, jazz-handing jaunt through Sherwood Forest, as they (dance) battled to save Maid Marion, Nursie and the villagers from the greedy grasps of king John and the Sheriff of Nottingham. Transporting the audience back to 1192, a simpler time when men wore tights, this production was packed with everything you want from a great family friendly show, including likeable characters and intellectually challenged baddies; inoffensive cheesy jokes, one-liners and slapstick humour; uplifting original songs performed by an upbeat cast; and puppets including the cute, pint-sized narrator Billy Wigglestick (Montgomery Farr) brilliantly handled and brought to life by Gareth Smedley; and of course a happy ending. This original, professional show will make a fantastic introduction to live theatre for the Cbeebies / television talent show watching next generation. Far, far and away my favourite performance on the night came from Felicity Thompson as Maid Marion, a classic English rose with 21st century confidence, girl power and attitude who immediately made herself a great role model for the girls in the audience, and I can imagine equally at home if she ever ventured into kids television presenting as on stage. I also can’t praise enough the band of co-ordinated skunk scouts, who brilliantly added to the show’s girl power message with their blend of the female equivalent of Peter Pan’s lost boys and a brownie pack and were by far the best kids ensemble I have ever seen on stage. Of course you can’t review this show without mentioning Robin (played by Michael Coldwell) who had the whitest teeth you will ever see on stage and would make Rylan Clark proud; and his Sherwood Hoodies (Matthew Dabbs, Steve Wainwright, Anna Kozak, Chris Badham and Kyle Baker) whose combined performance troop were the glittery, jazzy hands, showbiz aspiring equivalent of The A Team, who with the help of Marion (in a plot that reminded me of the classic kids show “Maid Marion and her Merry Men”) became slightly more like the traditional outlaws we all know. Other characters I must mention include Daniel Fisher as the sulky, drama queen King John, played with a large pinch of Peter Ustinov’s version of the character from the 1973 Disney animation; Peter Holliday as the likeable, Buttons equivalent Will Scarlett who the audience quickly rooted for and whose comedy bow and arrow trick shots provided the best physical comedy of the night; Denise Cooksey as Nursie, who reminded me of Keeping Up Appearances actress Judy Cornwell; and Jenna Dabbs and James Smith as the torturers Gavinya and Genghis, who in the week of Ken Dodd passing away provided an unexpected tribute to him with their use of tickling sticks (aka feather dusters) as a torture device. With many of the cast also having roles in the production team, including Felicity who proved Maid Marion can also brilliantly turn her hand to choregraphy, I must praise Craig Hawkes for the well-written hilarious and original script, the show’s producing, directing and colourful wardrobe thanks to Jenna Dabbs and musical director Matthew Dabbs for the show’s positive music numbers, that made aspects of the Muppet Show theme tune, James Bond and classic Disney numbers their own with great lyrics sung beautifully by the cast with crisp clear voices and that ultimately proved that songs can save the day. Robin and the Sherwood Hoodies has three shows left at Sheffield Montgomery Theatre on Saturday 17 March at 11am*, 3pm and 7pm. For further information and to book visit http://themontgomery.org.uk/. Founded in 2017, Far Far Away Theatre is a new Sheffield based, professional, family theatre company that aims to bring theatre to everyone. For more information visit www.farfarawaytheatre.co.uk. *The 11am is a signed (BSL) supported performance where a team of local MENCAP volunteers and support workers will be on hand to help audience members around the theatre.